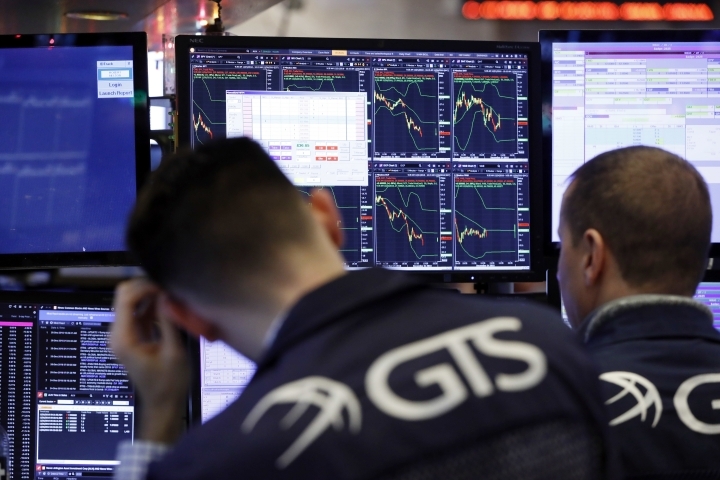 NEW YORK — While professional traders on Wall Street scrambled to sell stocks amid a fear-fueled, nearly 20 percent drop for the S&P 500 late last year, most people at home remained relatively calm when it came to their own retirement savings. So say numbers from Fidelity Investments, which show that the vast majority of 401(k) participants continued to sock savings away in their accounts and refrained from the perhaps-tempting choice to abandon stocks and hide out in the safety of cash. Investors held the steadfast approach even as the average 401(k) balance dropped to $95,600 by the end of the year, down 10 percent from three months earlier. The chief culprit was a fear about a possible recession, which sent the S&P 500 down 19.8 percent between setting its latest record high on Sept. 20 and hitting a bottom on Christmas Eve. It's an encouraging sign because stocks have historically provided the best returns over the long term. So, as long as someone is willing to stomach such bouts of volatility and hold on for years, owning stocks is one of the best ways an investor can have a bigger pot to pay for retirement. "The most encouraging thing is that most people didn't have a knee-jerk reaction, and they continued to save or increased their savings rates" said Jeanne Thompson, senior vice president at Fidelity. "This is the proof that the messaging has gone through. We've come a long way in the last 10 years." Much of the credit goes to one of the most powerful forces in investing: inertia. People often lean toward making no changes, particularly when it involves something as big and complicated as saving for retirement. Employers and the investment industry have tried to harness that for good by automatically enrolling workers into 401(k) plans, automatically setting them up to increase their contributions each year and automatically placing their savings into target-date retirement funds. That way, if workers take no action with their 401(k) accounts, they're still saving a portion of each paycheck and putting their money into investments that are appropriate for their age. Last quarter, 99.1 percent of all 401(k) participants at Fidelity continued to regularly contribute, the highest percentage since early 2011. Target-date funds take care of how to divvy up an investor's nest egg, and they keep a lot of money in stocks when retirement is decades away and shift to more bonds as time goes on. That allows savers to put the investment decisions on auto-pilot, and only 5.6 percent of Fidelity's 401(k) investors changed how their assets were divvied up during the fourth quarter. "The market went down," Thompson said, "but in terms of employees' behavior, it continues to remain incredibly positive."